Connected DVR maker Simple.tv just launched a new feature that will make it easier for users to share TV shows with their friends and family — and in turn possibly get Simple.tv a few new customers. 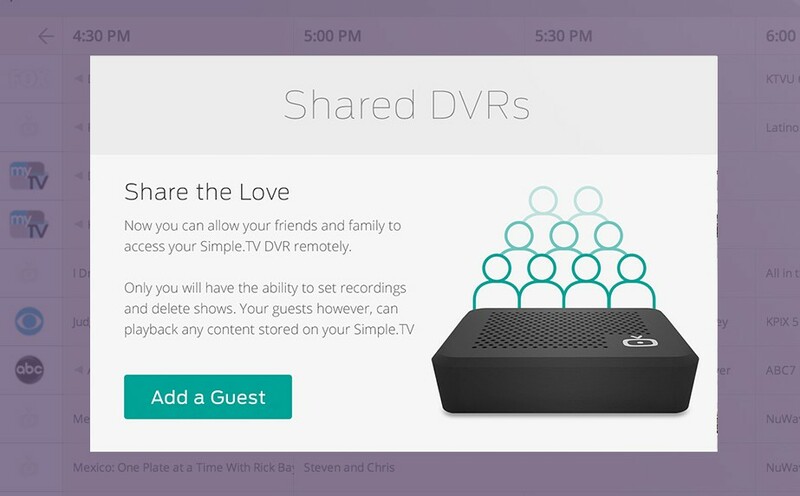 Owners of Simple.tv’s DVR for cord cutters can now set up guest passes to let others access their DVR recordings over the internet. Guests are able to stream recorded shows from Simple.tv’s web interface, as well as through the company’s mobile apps and even its Roku app. However, guests aren’t able to tune into live TV or actually schedule any recordings, so guests won’t ever hog any of the DVR’s tuners. Simple.tv founder and CEO Mark Ely told me during an interview Monday that up to five users could access recordings at the same time without any performance issues, provided that a user has enough upload bandwidth capacity available to facilitate those streams. Simple.tv owners can also set up guest passes for users within the same household, which Ely suggested as a way to give kids access to the DVR without giving them the ability to schedule or cancel any recordings. But the main hope for Simple.tv, obviously, is that guest passes help to promote the product in a try-before-you-buy fashion. Guest passes aren’t the only new feature Simple.tv is rolling out. The startup also just updated its Android app with a more traditional, cable-like grid TV guide in addition to its existing content-based guide. A similar update for the Simple.tv iOS app is on its way, and Ely said that this guide will be coming to the Windows 8 and Windows Phone apps soon, too. Both updates will be available to owners of Simple.tv’s first- and second-generation hardware. Ely said that Simple.tv is also looking to make some changes to its website, which include the integration of a new video player that won’t depend on Silverlight anymore. And this fall, the company will begin a limited beta test of a cloud DVR feature that Simple.tv first showed off at CES in January. The reason this is legal while Aereo isn’t is that you own all of the equipment. TV signals are broadcast for free and you can do what you want with them within your own house. Aereo was found to be illegal because the court decided that it was re-transmitting the TV signals without permission to a public audience. With Simple.TV, Tablo, TiVo Roamio, and ChannelMaster DVR+, the main use is watching content within your own home. Although some of these devices also allow streaming content over the Net to your mobile devices while you’re away from home. I too question the legality of this. The caselaw that allows recording of TV shows was for time shifting, not for sharing with your friends over the internet. This looks an awful lot like peer-to-peer file sharing of music, albeit to a small universe of users. I believe there is a good case that the person sharing the recordings would be guilty of violating the copyright owners’ exclusive right of distribution while the third party streaming them into their home would be violating the copyright owners’ exclusive right of reproduction. Simple.TV, meanwhile, would be potentially liable of contributory and vicarious infringement. I’m a Simple.TV user. I think I’ll pass on this one. I too question the legality of this. The case law that allows recording of TV shows was for time shifting, not for sharing with your friends over the internet. This looks an awful lot like peer-to-peer file sharing of music, albeit to a small universe of users. I believe there is a good case that the person sharing the recordings would be guilty of violating the copyright owners’ exclusive right of distribution while the third party streaming them into their home would be violating the copyright owners’ exclusive right of reproduction. Simple.TV, meanwhile, would be potentially liable of contributory and vicarious infringement. Getting Silverlight out of the picture would be great.